Wait, you already know how to make rice? Well then go away of you, sillypants. You have other things to read about. But for the rest of you, for whom rice that doesn’t have the word Minute in front of it, or boil-in-bag (NO!) behind it, allow me to explain the mystery. 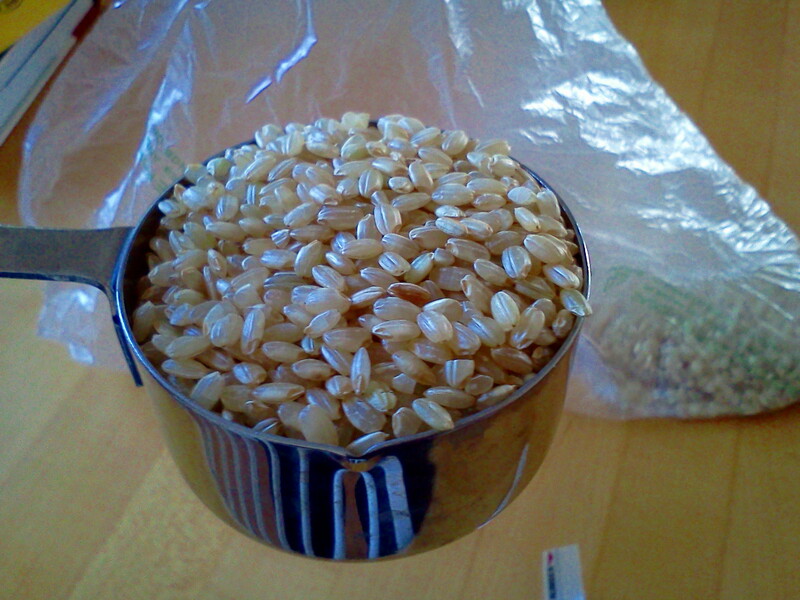 Get yourself some nice, short grain brown rice from the bulk bin. Make it organic if you can. Why short grain? Because it’s nice and starchy and will make you feel so warm and cozy inside. It’s such a comfort food it’s a miracle that it is so good for you. It’ll cost under $2 for a pound of the organic stuff from the bulk bin, and a pound of it will make a lot of rice (about six cups). Generally, 1/3 cup of dry short grain brown rice will give you a cup of cooked rice, 1/2 cup will yield 1.5 cups, 1 cup will yield 3 cups; we could go on like this all day but now let’s make some rice. Once you have worked out how much rice you would like, lob it into a pot. 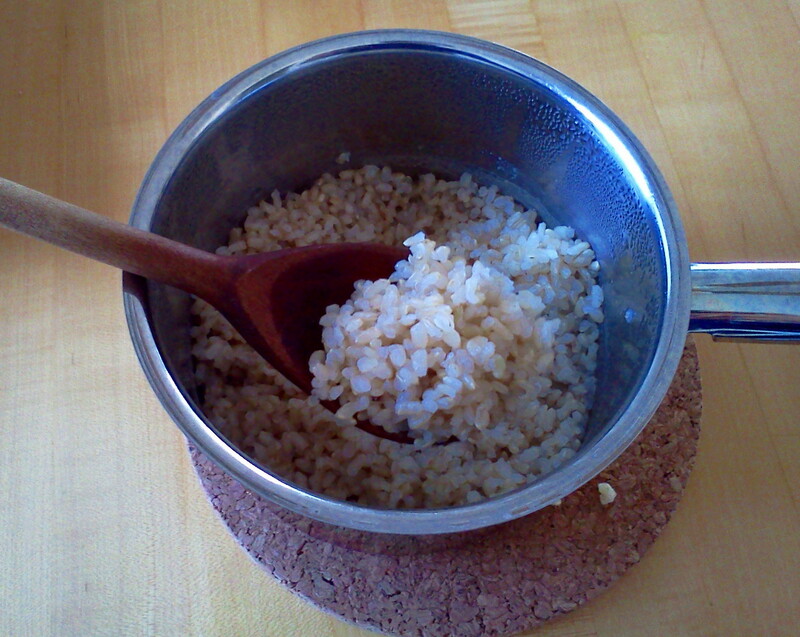 Here is a picture of the rice all measured up in an actual measuring cup (highly recommended). It’s a whole grain, but who cares? It’s DELICIOUS! 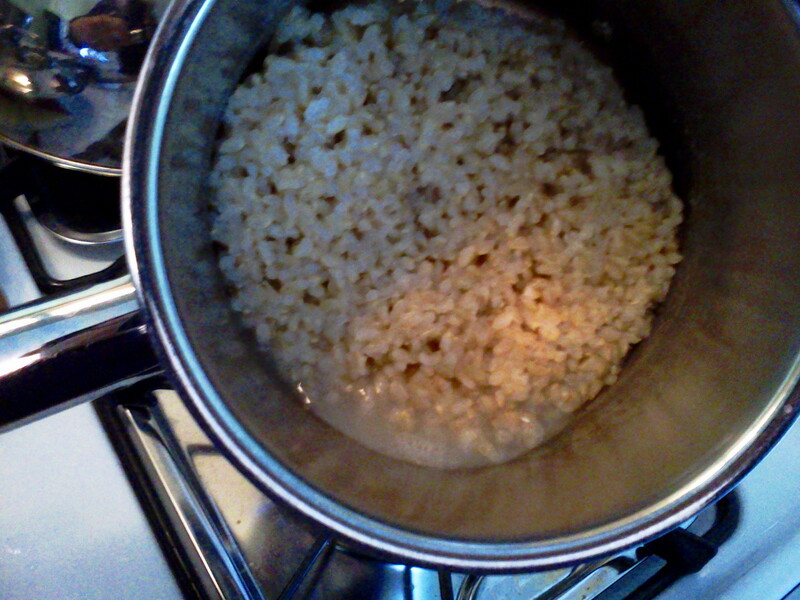 You’re really supposed to boil water first at this point — about 2 cups for every cup of rice — then add the rice. You should/could also use a measuring cup made for liquids for the water. I’m too lazy/busy for that. I add the rice, use the same (dry measuring) cup I used for the rice to add 2.5 cups of water for every cup of rice because I like mine a bit sticky. If you’re going for fluff, add 2 cups of water for every cup of rice. (If you’re making 1/3 cup of dry rice, fill the measuring cup with water 2.5 times and by the time you add it to the pot the cup is almost all the way clean. I told you I was lazy). The instructions always say to keep the lid on, but whenever I do, the pot overflows with foam. You can avoid that by adding a teaspoon of oil if you like. 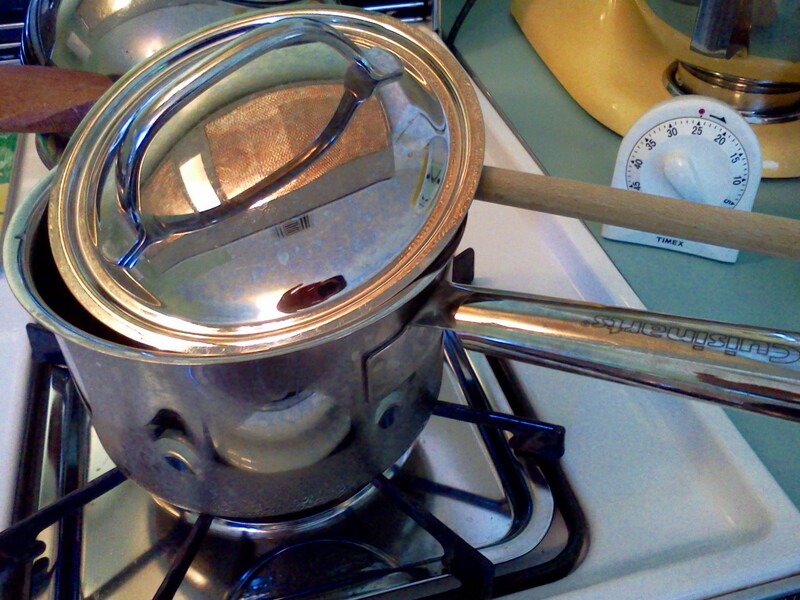 Instead, I leave the lid ajar, balanced on my well-worn wooden spoon over low heat. Set a kitchen time for about 25 minutes and walk away (not too far). Check on the rice after the timer rings — the water should be a bit foamy and still hovering over the top of the rice (eventually you won’t need to do this; you will have rice-making confidence and you’ll know when to look for this last last bit with the leftover liquid). Set the timer for 15 minutes and run off to do something else you forgot to do (I’m projecting here, but really, could it just be me who forgets?). I think I steamed the ol’ cell phone, but you get the picture: When you tilt the pan, there’s a little liquid left. Let it steam for 10 and it will disappear, leaving starchy goodness behind. When the liquid is closing in on the bottom of the pan (it’s below the level of the rice but not wholly evaporated), turn the off the burner, put the lid on, reset the clock for another 10 minutes, look over the kid’s homework, the mail, or ponder the wonders of the Universe and then, pow, it’s go time: yummy rice. Make extra and store in the fridge for a few days worth of delish. Add tofu, beans, ricotta, whatevah. For an updated version, in which I actually rinse the rice and boil the water first, click here. This entry was posted in eating well, fast FOOD, gluten free, Uncategorized and tagged brown rice, rice. Bookmark the permalink. I’m not a big fan of brown rice unless it was white to begin with and fried brown. To me it’s just different and harder to cook. Good instructions though! I know it’s healthier than white rice.